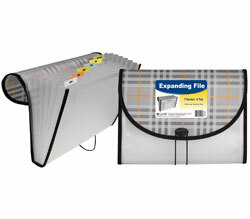 Letter size expanding file is made of durable, acid-free polypropylene. Letter size expanding file is made of durable, acid-free polypropylene. For 11 x 8 1/2 document storage. Includes pre-printed tab inserts and button and elastic closure. 13-pocket/12-tab size. Assorted Tropic Tones colors include Seaside Blue, Sunny Yellow, Seafoam Green, Sunset Red, and Sandy Gray. Minimum purchase quantity is 12 units (one display).